Q. Is there a “medical waiver” available for the Green Card Medical exam and if so how can one be eligible for it? Ans A “medical waiver” can be granted by the USCIS , the immigration body in the USA if the applicant falls in the eligibility criteria. If the applicant is granted medical waiver then he or she is permitted to remain or reside in the U S in spite of having a medical condition that could have otherwise made the person inadmissible. The applicant becomes eligible for classification as a self-petitioning spouse or child (including derivative children) because of abuse. Q What does ‘medical grounds of inadmissibility’ mean? This entry was posted on November 5, 2015 . Too Many Cases Of Wrong Arrests And Deportation? For years the agents of I C E, or the Immigration and Customs Enforcement have been asked to concentrate on sending back or deporting hardened criminals, not small-time offenders and those who pose little danger to society. But a deportation case that transpired in rural Louisiana proves the very opposite, suggesting that ICE does work with police departments to encourage racial profiling, unfair detention and other civil-right malpractices. A case arose in a small town near the Texan state border in the month of May. Two Honduran men were arrested by police officers; the police demanded to see their papers. Although the men were not charged with any crimes they were still handed over to the Border Patrol and then to ICE. They were then detained as illegal immigrants who had been deported in the past. The men awaited deportation for more than 140 days, when a racial justice body filed a civil complaint on their behalf. The men seemed to have been arrested and then detained for a long period of time, without the cover of any local law-enforcement agencies charging them for a crime. But this was ignored – one of the immigrants was deported and deportation of the other was soon expected. This entry was posted on October 26, 2015 . Sanctuary cities in the United States and Canada are places where certain policies are enforced to protect illegal immigrants from what people in these cities see as unfair immigration policies. These cities go against what they term as “unfair” immigration policies by choosing not to enforce them, by having their police keep information on criminal immigrants from federal immigration officials. Thus illegal immigrants, including those with criminal convictions, escape prison and deportation. The Congress is in the process of enacting laws that will penalize sanctuary cities by denying federal funds for other programs. This comes in the wake of the brutal killing of 32-year-old Kate Steinle, allegedly by an illegal alien, in the sanctuary city of San Francisco. The alleged killer is an illegal immigrant and a seven-time felon who had been deported to Mexico five times. The indifference of the politicians in San Francisco to the murder, from City Hall to the halls of Congress, was alarming and Washington lawmakers crafted Kate’s Law to make sanctuary cities accountable for enforcing federal immigration policy to protect other innocent people. 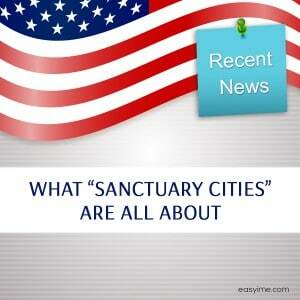 It is widely believed that sanctuary cities also reflect a breakdown in the law and order situation. Defiant city mayors and city council members who ambitiously want to advance their political careers support policies — in this case, immigration policies — counter to those set by Congress. They believe their wisdom is greater than Washington’s on immigration policy. This entry was posted on August 8, 2015 . The alarming increase in last year’s surge of unaccompanied children and families who infiltrated into the border from Mexico and coming from countries of Central America has gone down considerably, almost by half, this year. According to a US Customs agency this has been due to some strict measures taken by the U S Government on the borders and some strict efforts by Mexico too. By many standards the scenario is not so serious and urgent as it was last year – actions by the U S Government and other factors have contributed to the easing out of the crisis, which has been markedly high in the last decade. Illegal immigration from Mexico too has gone down dramatically since the year 2000, when patrol officials had rounded up around 1.6 million Mexicans. Last year only 230,000 people had transgressed the borders. What’s more, according to an immigration report about 1 million Mexicans who were living illegally in the country have left the country. 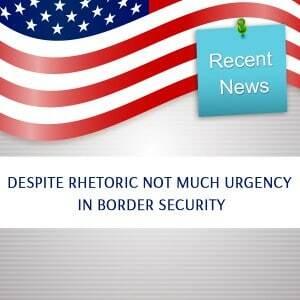 “The urgency is gone on the U.S.-Mexico border,” said a border security analyst for the Washington Office on Latin America, a think tank. Last year more than 468,000 arrived from countries of Central America, which happened to be more than those migrants from Mexico. This entry was posted on August 6, 2015 .